We seem to tell a tale of two hearts these days, one based on Love, and the other, Fear. The version steeped in Fear says that Love isn’t realistic in such a modern world. But what I know for True is that Love isn’t about rose-colored glasses. It’s about action. 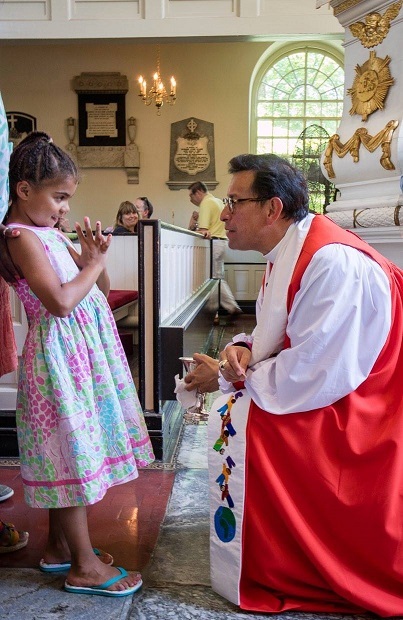 I recently had the joy of attending the ordination and consecration ceremony for Daniel George Polycarp Gutierrez, as the 16th Bishop of the Episcopal Diocese of Pennsylvania. Now, that’s a mouthful. And my goodness, but this was a big tooting deal. I knew it would be, but even I was amazed by, as they say in Episcopal circles, all the bells and smoke and ceremony. But I was amazed most by something far deeper. Full disclosure—this is not my religion. Now, anyone who knows me, knows that I’m not so big on organized religion at all. Not that the church, in all of its iterations, hasn’t done a lot of good in the world. But at least as often we cringe at the negative aspects of power and control, of nefarious deeds that seem to crop up from all corners. Mainly, when it comes down to it, church hierarchy has always just given me a headache. But a spiritual path is something much more vital in my world, and I honor whatever route leads anyone to a relationship with the divine. Although I don’t subscribe to any label, I follow, or try to, the teachings of the Christ. But labels often merely get in the way. Which works on all levels, including spiritual ones. God just shows up in many forms. The honor to attend this ceremony came from my dear friend and sister, Suzanne, the wife of the now Bishop. We’ve been friends for 40 years, and I cannot imagine this life without her. She’s simply one of the dearest people on earth. I am aunt to their son, Jude, and still cannot figure out how he has become a senior in high school. But a fine young man he is growing into, indeed. So anyhow, I attended the ceremony and all the weekend festivities, as part of the family. Participating were several Bishops. As well as the Presiding Bishop of the United States, a delightful man, always with a laugh or a smile and a twinkle in his eye. And all the other hierarchy, which sort of escapes me now. 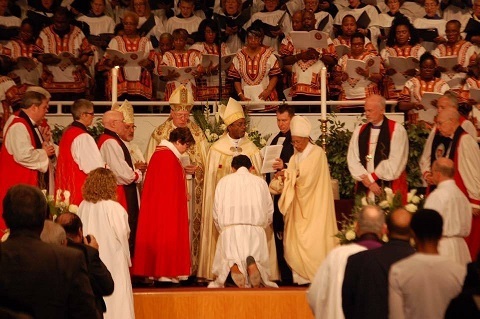 The newly consecrated Bishop, however, is to me, well, still Dan. I’ve known him for over 25 years. I remember when he was wooing Suzanne (and woo her, he had to do!). Known him through their careers, through the birth of their son. Through many, many times of both heartache and joy, beginnings and deaths. Through all those passages that humans must go. I have watched him grow through all of these, as he worked in the political arena as well. He has always been a man of ethics and morals (which doesn’t quite square with our idea of politics, right?). But I’ve also gotten a ring-side seat as he’s grown from an idealistic youth into a fine man. One who takes the admonition to love one another as a main tenet of his life (in both professional and personal realms), manifesting this through the things that he does. Whether those be leading a church, counseling people in great grief, or volunteering at the soup kitchen on Thanksgiving Day. And a million things in between. As Bishop, he now answers to the aforementioned Presiding Bishop of the US. And the Presiding Bishop answers to the Archbishop of Canterbury. You know the one—who meets once a week with the Queen of England. Yep, a big tooting deal, indeed. But none of the pomp and circumstance is what amazed me. Even though it was beautiful. Although both Barrett and his brother will forever be known for their reactions to the communal wine. Suffice to say when grown wine won’t likely be a beverage of choice for either! Which they proclaimed to all the adults within earshot. Many people of other beliefs attended as well. One wonderful couple who came from Albuquerque, members of the Jewish faith, participated in all and were moved to tears throughout. Most of us shed tears of joy that day. And I cannot imagine anyone there not feeling the depth of love. I know it sounds corny. But a deep, abiding love beat from the hearts of everyone around us, from those up at the alter to the incredible choirs (yes, two! ), to the people sitting in the pews. This was personal to the people involved in the ceremony. They knew and loved one another. They told each other such. They meant it. You couldn’t help but be enveloped by it. You couldn’t help but be moved. You couldn’t help but feel a connection to those around you, and be filled with hope in this uncertain world. 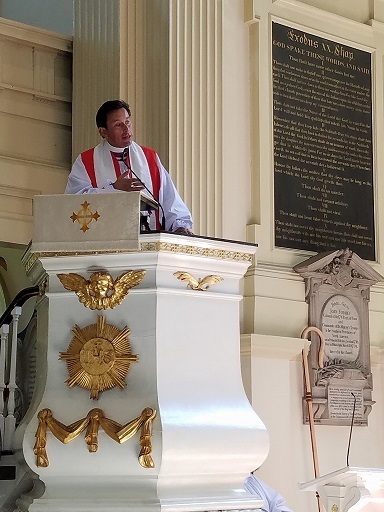 The next day, the new Bishop gave the message at Christ Church in Philadelphia. And ah, what an incredible church this is! Established in 1695, the building was completed in 1744. Often referred to as “the Nation’s Church,” or “the Patriots’ Church,” Christ Church was frequently visited in the Revolutionary era by members of the Continental Congresses, Washington’s troops, and the Constitutional Convention. On July 4, 1776, Christ Church publicly banished King George’s name from divine worship—an act as dangerous as signing the Declaration of Independence. Seven signers of the Declaration are buried in the grounds of Christ Church, and it has counted as its members Benjamin Franklin, Betsy Ross, Andrew Hamilton, George Washington, and many more. Oh, my. You can just feel them there. Feel a sense of the Freedom for which they fought, the Hope in their hearts, the depth of what they believed in. The very Liberty for which they struggled whispers on the winds. The entire building fairly breathes history. So, quite fitting the new Bishop would choose that church to give his first message after his consecration. Because the other thing I know about Dan, is that respect and justice for all flows through his very veins. That combined with the depth of love from which he operates, the alleviation of suffering is his life’s mission as well. And fitting, his message that morning. On the heels of the deaths of yet two more young African-American men at the hands of law enforcement, followed by the deaths of 5 police officers in Dallas, the hearts of this nation were again heavy. So, what did the new Bishop say? He focused on the idea that all people are created equal. That no matter our differences—how we worship, the color of our skins, the difference in gender, whether we’re straight or gay—when boiled down to our essence, we’re all humans. We have the same needs, the same fears, the same desires. We all bleed red. We have the same needs, the same fears, the same desires. We all bleed red. We all want, in the deepest recesses of our hearts, to be valued and loved. His charge was for everyone to get involved, to make a difference in what was occurring in our world, in our small corners of it, to those around us. Not to proselytize. Not to judge. But to lend a helping hand. To be the solution. It provided a profound end to a very poignant weekend. And restored for all there our faith in the power of love. Love is always more fierce than fear; always stronger than hate. I may be Pollyanna, but I have a fairly good grasp on history. And never have I seen the converse ultimately prevail, although sometimes in the midst, that may appear to be so. So although this Bishop will always be Dan to me, what an enormous joy to watch him don his official robes, to see him grow into them before my very eyes. And mainly, to provide more hope for the good he will do—not just for his denomination, but for this country as a whole, and thereby, the world. I’m excited to see what Love will do. The mountains that will be moved. What a beautifully written post! I enjoyed your perspective about the event and about life. We all need more love, less fear, and a moment when we can believe in the goodness of humans. I attend an RCA church which is similar in some instances to the pomp and circumstance of an Episcopalian or Roman Catholic church. Beautiful pictures, makes me miss my home church! Hope you can get back to it, Brianna! Wish I could have been there! He is still Uncle Dan to me too ! I am so proud of him! We missed you, Stephanie! It was all truly profound. What an amazing experience you had and shared with us, Susan! It must have been so empowering and reaffirming to witness someone (who is close to you too), walk their talk. To encourage others to do the same. I do believe that our solutions will come out of people becoming involved in the world around them. From the local level on up. And to get involved from a place of love, compassion and community. Watching Reverend William Barber II at the Democratic National Convention, moved me in the way you share here. Thanks for this perspective and for showing us love is alive and well, even when we don’t necessarily see it at work! This is a moving story – the pride and admiration you have for your brother-in-law comes through loud and clear. Any true person of God will be a source of inspiration and admiration. Lucky for you, this person is also part of your family. I am so blessed, Audrey. And I so agree on those who are sources of inspiration! Beautifully written. My sentiments exactly. Thank you, Liza, and thanks for stopping by! Thank You Susan for your Beautiful post , it was and I loved it and there is a part where you you say not to judge. I am in favor of this, and feel we are here for a reason and not being judgmental is part of the process that we have taken. Gratitude for life and helping other’s is my passion. Your post was beautiful and I truly enjoyed this. I so agree, Lori. We can never really know what’s going on within others. We all have walked through hell, at some point or another. We’re all human! Dan is a representation of what is also in you Susan. In all of us. It is a gift to have a such a wonderful reflection nearby. We know far too well there are naysayers and harm around every corner. Such a beautiful story and heartfelt words expressing the meaning and it all leads a reader to feel hope and hopefully see their own possibilities. Beautifully said, Teresa–it is my hope that readers feel that hope, and see their own possibilities. Love that! Susan – So glad the experience was so positive for you! Whenever I attend a religious event like that I so wish they could all be that way! I can hear how inspired you are in the post Susan! It is so refreshing to witness the power of love. Oh, it is, Rachel, it is! So true, Jasmine. We do, don’t we. If we could all just remember that . . .
Oh-so-true, Joan! We do, we do. And the love that moves mountains . . . I personally love ceremonies like that. Congrats to your new Bishop and that you were able to participate. Here is to Love. A purposefully seek out websites that share great news. There is so many bad stories shared on the local news and it seems like it takes less effort for people to complain rather than to share something wonderful. I appreciate your post for bringing a great story to light! I’m with you on that, Crystal! Great piece, Susan, and I especially loved (to follow your theme!) the first photo of the bishop with the little girl. Priceless and it speaks volumes for the kind of man he is. Thanks for sharing this. Beautiful. Thanks for spreading the message of love. Every voice that can speak about it adds to the swell. I always think of the Hundredth Monkey Syndrome, Kimberly. Every voice gets us closer . . . So glad I read this again. Often I look at people who have risen to lead and I know they started out as you and me and they still are you and me. We feel such a sense of pride with the love to know this man, this New Bishop is your friend Dan. I imagine had I been there I would have had tears of joy. Have limited experience inside churches but was in one recently & the gal who sang touched my soul with her voice. Isn’t it funny how we can feel love and joy, no matter where we are, Roz! Beauty and Truth can be found everywhere. What a wonderful opportunity. We hear the message of love in so many forms, but to witness it is to experience it. The next best thing is sharing it with us. Don’t we love to share love, Joyce. And it allows us to experience it all over again!